Just a few weeks ago I held Director’s Cut in my hands, a movie by Penn Jilette, directed by Adam Rifkin, co-funded by me (well, it’s a crowdfunded movie and I supported it with a dime or two). 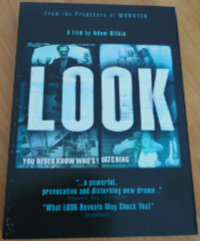 In their talk about the movie, Penn mentioned Look, a movie done by Adam that caused Penn to contact him for Adam becoming his director for Director’s Cut. Anyways, about 10 days ago I found that the big online store in the US does have a copy of the movie and ships to Germany. Well, yesterday the DVD arrived at my home. It was also funny to see Hayes MacArthur again (whom I’ve seen in Director’s Cut) and Jamie McShane (who had a major role in Bosch last season, previously on Grimm, Breaking Bad, Thor). But that’s just me. One might know better of Chris Williams (Californication) or Rhys Coiro (The Walking Dead, Hostages, 24). So quite some names on this movie, too.